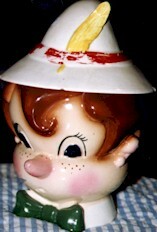 Pinnochio cookie jar by Metlox. Marked "Poppytrail". This cookie jar is very rare. Lid has a chip.